Why targeting decisions can be the most-powerful strategic decisions you'll ever make. The misconceptions that prevent B2B companies from making good targeting decisions. 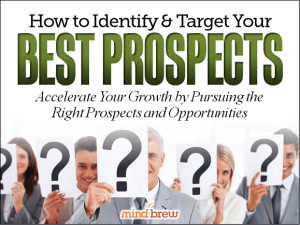 Identifying the types of prospects and opportunities that can fuel exponential growth. Strategies and tactics for zeroing-in on your best prospects in the broader marketplace. When things don't turn out as expected or desired, it's just human nature to look for explanations beyond what might be perceived as a personal failing. Learn how Sales Ops can address the common "reasons" for poor sales performance. It’s so easy to get caught up in the tactics of selling. But your sales strategy shouldn't take a backseat to the tactical to-do list. This recorded training session helps you get beyond the tactical and understand what real strategic selling is all about.